Oscar winner Denzel Washington (Glory, Training Day) received another Oscar nomination for Best Actor at the 2018 Academy Awards for his betrayal of human rights lawyer Roman J. Israel Esq. in a film of the same name perceptively directed by Nightcrawler director Dan Gilroy. Dan Gilroy expands his notion of urban cinema further in the compelling legal drama Roman J. Israel Esq. whereby the city in this case Los Angeles becomes another character in his film like it did so vividly in the disturbing Nightcrawler. Its Roman who is living in downtown L.A. who doesn’t drive and catches public transport, living in an old apartment building next to a condominium construction site whereby he continually complains to city authorities about the after all hour noise levels. Roman J. Israel Esq follows the story of an out of touch human rights lawyer who is unwillingly thrust into the legal limelight when his more esteemed partner has a sudden heartache. Roman takes on a case about a young African-American boy who is accused of killing an Armenian drugstore worker. However, Roman’s case soon is not what it seems when he falls under the guidance of hotshot attorney George Pierce, a slick oily performance by the impressive Colin Farrell (The Beguiled). Pierce soon lures Roman into the corporate legal world with plush offices in a downtown skyscraper overlooking a busy Californian highway. Roman also has to contend with his own ethical and moral convictions as he battles with the idea of being seduced by the trappings of wealth and commercialism, which conflict so sharply with his idealistic human rights beliefs. These beliefs are embodied in Roman’s awkward relationship with the head of a civil rights Non-Profit organisation, Maya Alston played by Nigerian British actress Carmen Ejogo (Fantastic Beasts and Where to Find Them). Roman’s former law firm is being wrapped up by his incapacitated partner’s niece Lynn Jackson played by Amanda Warren last seen in the Oscar winning Three Billboards outside Ebbing, Missouri. 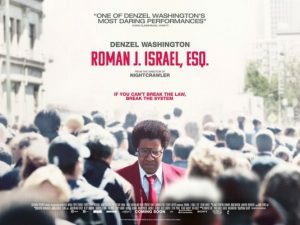 As the case of the young accused becomes increasingly more complex and Roman J. Israel Esq in a desperate bid to earn fast cash does something illegal against all ethical considerations, the consequences of which come crashing down on a L. A. lawyer who like the inner city he dwells in, eventually consumes his entire existence. Roman J. Israel Esq is a compelling examination of dignity, career ethics and the seduction of wealth, held together by a mesmerizing performance by Denzel Washington who plays the civil rights lawyer grappling to adapt to the changes of a millennial environment, while still listening to his Walkman and clutching a bulging briefcase on a legal motion to transform the Federal law system by giving each defendant a stronger chance of being represented equally and fairly before the law. 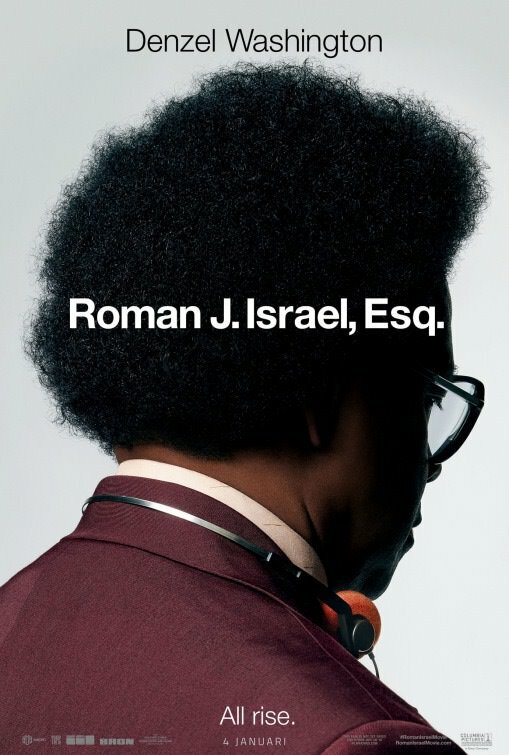 Roman J. Israel Esq gets a film rating of 8 out of 10 and is highly recommended for those viewers that savour a complex and ethically dubious legal thriller filled with conflicting images of paranoia and idealism. The opening shot of Dan Gilroy’s gripping thriller Nightcrawler is of a blank bill board set against the glittering skyline of downtown Los Angeles. The introduction of the anti-hero Lou Bloom, expertly played against type by Jake Gyllenhaal (Jarhead, Brokeback Mountain) is of a lonely scavenger in a hostile metropolis desperate to make a quick buck. Bloom is even stealing manhole covers to sell to scrap dealers. Bloom claims he is desperate for a job, any job and spends his days flicking through the multitude of local TV News channels and surfing the internet, an epitome of loneliness and desperation, an ideal sociopath. Nightcrawler picks up the pace when Bloom drives past a horrific accident and he sees a videographer Joe Loder played by Bill Paxton filming the bloodied carnage. Loder tells Bloom that he sells the accident scene footage to any of the city’s seedier local news networks for cash. By its definition Nightcrawler is a scavenger filming the underbelly of a city as there are car accidents, housebreak-ins, plane crashes and shootings and any footage from the previous night makes the Morning News on one of the Los Angeles TV News channels. After pawning a stolen bike from Venice Beach, Bloom buys a camcorder and soon begins the night prowl where he is quick to pick up the art of framing an image, showcasing all the evening’s carnage to Nina Romina, a glamourous slightly ruthless news editor wonderfully played by Rene Russo (Lethal Weapon, Thor, The Thomas Crown Affair). Upon their first meeting the electricity between Bloom and Romina is electric, two amoral characters caught in a sort of dysfunctional older woman younger man relationship based on mutual infatuation and shared amoral vision of a heartless society. The hardened Romina recognizes Blooms uncharacteristic drive, his insatiable thirst for disturbing news imagery and his ruthless lack of empathy for any of the victims involved in these awful occurrences from home invasions to traffic accidents to domestic disturbances. Director Gilroy brother of Tony Gilroy who did the acclaimed film Michael Clayton is adept at showing the gritty underbelly of the American dream, a world where it really is each man for himself in a ruthless race to survive in the post-recession free market capitalist economy which has stripped many of these American cities of its lustre. Los Angeles with all its film noir qualities becomes a central landscape in Nightcrawler, a dystopian inspiration for an American dream gone awry captured soon brilliantly in Paul Schrader’s The Canyons and Quentin Tarantino’s post-modern crime epic Pulp Fiction. Nightcrawler’s intensity gains traction when Lou Bloom, ever the ruthless entrepreneur hires a desperate drifter, Richard as his assistant and co-driver, wonderfully played by Riz Ahmed from The Reluctant Fundamentalist, a needy relationship which is ripe for exploitation right till the bitter and shocking end. 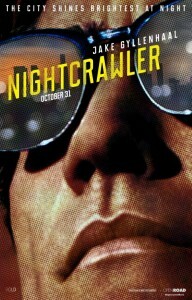 What makes Nightcrawler so unique is that its theory that what viewers consume on 24 hour television news channels is a collection of fabricated images, ever reminding us that however real that Television footage looks, it’s is still constructed and edited to maximum visual effect, primarily to shock the audiences into a dull yet primordial complicity unique to human fascination. “Think of our news broadcast as a screaming woman running down the street with her throat slit”. 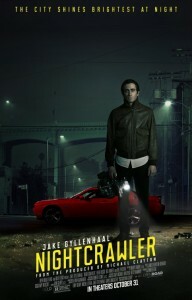 Gyllenhaal delivers a deadpan performance as the vile antihero, Lou Bloom, certainly one of his career bests, where above all his sociopathic tendencies he emphasizes the dangerous power and fatal attraction of loneliness exemplified in director Nicholas Winding Refn’s excellent film noir classic Drive. Dan Gilroy’s thriller Nightcrawler features a narcissistic, brutal and sociopathic amoral central character set in a gritty, crime ridden Los Angeles throwing up a disturbing view of contemporary American cities as being entirely devoid of emotion or community. Gilroy’s flair for cutting dialogue is influenced by Tarantino and his visual language is influenced by such luminous directors as David Lynch and Paul Schrader. 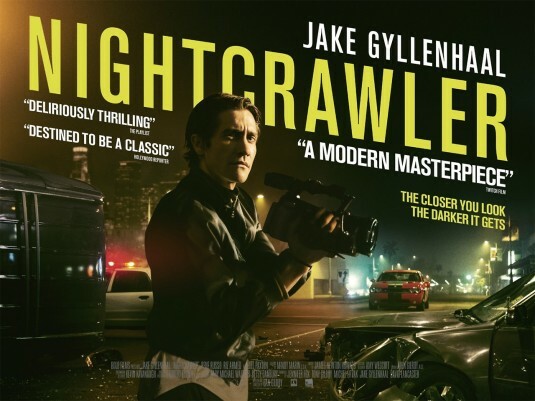 Nightcrawler is a first rate film recommended for viewers that enjoyed Drive, Mullholland Drive and Pulp Fiction with Jake Gyllenhaal giving one of his most creepiest performances in ages as the ruthless videographer and ambulance chaser Lou Bloom.